In 2002 I received my B.S. in Biology from U.C. Irvine. During school, while working as a kennel attendant at a veterinary clinic, I met my wife Teresa. Following completion of school I worked as a laboratory technician in the endocrinology department for Quest Diagnostics for almost 2 years. I married Teresa in the summer of 2003, and whilst on our honeymoon, we fell in love with New Zealand and I made the life changing decision to move there and apply to become a Veterinarian. I was accepted into the AVMA accredited program at Massey University, in Palmerston North. I graduated in December 2008 and moved back to California to begin my career. I started at Groveway Veterinary Hospital in Castro Valley, CA working as a full time associate veterinarian. Then in April 2012, along with a fellow veterinarian, we purchased Groveway Veterinary Hospital. For the next three years, I worked as the Clinical Director, managing upwards of 20 staff and dictating clinical/medical policy. In May of 2015 I made the difficult decision to leave California behind and make the jump to Kihei. It is always hard to leave behind a successful practice and many friends and colleagues worked with and met along the way. I just felt that Maui provided a better place to raise my two young daughters. I currently live in Kihei with Teresa, my daughters Cailin and Amelia and our four dogs (A Mastiff mix, a black Labrador and mastiff cross, an Anatolian/Great Pyrenees cross and a French Bulldog) and our four cats (1 Orange tabby cross, 1 British Blue cross, 1 Persian cross and 1 Tripod Tabby). In my spare time I enjoy spending quality time with my family and friends. Recently I have rekindled my passion for surfing, hiking and all the great outdoor activities that Maui has to offer. I am honored to have the blessing of Dr. Roger Kehler and his surviving family to carry on the rich history of Kihei Veterinary Clinic. Dr. Jenny Li Hellsen has been with KVC since 2000. She has spent many years working beside our founder Dr. Roger Kehler and has always been an integral part of our team. Although Dr. Hellsen’s education in Massachusetts provided her with her training in traditional western medicine, she has furthered her education and specializes in acupunture and holistic treatment alternatives. Dr. Hellsen current resides on Maui with her husband Andy and three amazing children. She has two dogs (Grapes and Aboo) two cats (Tabitha and Baby D) and a beloved tortoise (Nui). Welcome to our Ohana Dr. Hellsen! Dr. Christie Balcomb has always had a passion for livestock, growing up on a sheep farm in Northern California and working with beef cattle, sheep and pigs during her Animal Science degree from Cal Poly San Luis Obispo. She then moved to New Zealand where she completed her veterinary degree from Massey University, graduating in 2011. After graduation, she worked for Massey University Farm Services, teaching senior veterinary students and providing mobile rural veterinary care for dairy and beef cattle and assorted livestock. After 5 years in New Zealand, she moved back to America to complete an internship in ruminant health and reproduction at North Carolina State University College of Veterinary Medicine in 2013. 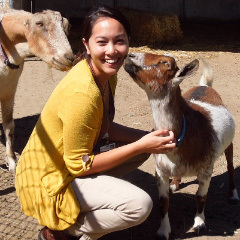 In 2014, she moved back to Northern California for a residency in Livestock Medicine and Surgery at the University of California, Davis, and in 2016 became an ACVIM Board-Certified Specialist in Large Animal Internal Medicine- Livestock Emphasis. During her residency she had extensive experience with all forms of livestock, with a special emphasis on companion livestock medicine and surgery. Dr. Balcomb has had a close connection with Maui ever since she was a little girl, coming for family holidays, spending the majority of time in Kihei. She looks forward to spending time exploring the beautiful natural features that Maui County has to offer. 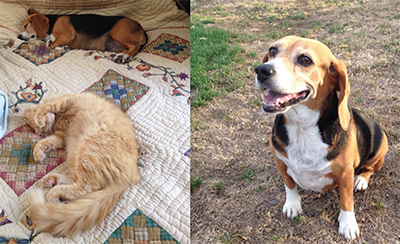 She is lucky to own a very special Beagle named Rita Mae and ginger tabby cat called Ziggy. Karen Hannie was born and raised in Upstate Rochester, NY. As a child, she always had opportunities to rescue, rehabilitate and care for animals. She found great joy in helping the animals that needed some form of care or needed a good home. In 1986 she joined the U.S. Army to serve her country where she gained invaluable experiences, discipline and dedication to excellence. After the military, she graduated from the University of South Carolina in 1993 with a B.S. degree in Marine Science. Working as an Animal Caretaker at the Riverbanks Zoo in Columbia South Carolina, she learned a great deal about large and small animals. She realized her true calling was in Small Animal Veterinary Medicine and became board certified as a Licensed Veterinary Technician from Gaston College in 2002. Through the next few years she gained invaluable experience working in Critical Care, Emergency Medicine, Surgery, rehabilitation and most importantly, patient-owner awareness, education and building client relationships. After moving to Maui with her wife in 2004, she felt it was important to owners and their pets to remain a Licensed Veterinary Technician. She continues to educate herself and maintains the annual requirements needed to be board certified and licensed. She believes it benefits the patients and their owners to keep up on new information, education, technologies and practices to keep their furry loved ones as healthy as they can be. She also experienced first hand how difficult and stressful it can be to move to Hawaii with pets. For the last 14 years, she has made it her mission to make the Direct Release program a stress-free and less complex process for the families moving or traveling to Maui. 14 years later, she & her wife are proud to call Maui their home and hope to spread the Aloha Spirit to those living here and to those planning to move here. Karen is a diehard Seahawk fan, loves fishing or being out on the ocean, loves playing cards with friends under her homemade tiki hut, being outdoors and sunset walks with her wife and two dogs. She and her wife have embraced the island and Aloha spirit and love living on Maui. 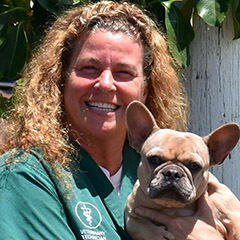 Fifteen years of experience in the Veterinary Medical field, and over 40 years of rescuing, rehabilitating and finding quality homes for animals has filled her life with true happiness. Every pet, who has blessed her life, has been a rescue from a shelter or from a family who was unable to continue to care for their pet. Not too many people can say they look forward to going to work. She truly loves her career. Mahalo Maui! Safron has been with Kihei Veterinary Clinic for over a year. She attended her veterinary technology program at Colorado Mountain College and has been pursing her passion for helping animals ever since. Her love and dedication to the animals of our KVC family has made her an integral part of our team! She enjoys hiking, paddle boarding, kayaking and snorkleing. Her fur family includes her cat Spike. Andre’a has been with KVC for two years and in that time she has filled a huge role here. Andre’a was born and raised on Oahu but started her career as a veterinary assistant 16 years ago in Las Vegas. We are very fortunate to have her years of experience here at KVC and look forward to having her here for many more years to come. Andre’s and her husband have 3 dogs (Sasha, Josie and Papi) 2 cockatoos (Harley and Fiona) and many fish. In her spare time Andre’a is starting an aquaculture business called Maui’s Freshwater Gems, helps operate Torres Security, and loves Ulua fishing with her husband.